I put this on a few times the other week whilst working from home (it’s good for that kind of thing) and ended up writing about it for my 00s project over on my blog. Which made me wonder, would this go down well at record club? At 55 minutes it’s longer than I’d normally pick, but when Graham pulled out of our last meeting due to illness, this jumped to the top of the pile of things to play on un-themed evenings. So I did. I’d never thought of it before, but on the night Tom and Rob pointed out that, on the vocal cuts (especially “Self Service”), whoever it is who’s singing sounds a LOT like Robert Smith. You know, that guy from The Cure. And he does. I’ve subsequently found reference (on Wikipedia no less) to them being “the missing link between Lindstrøm and The Cure”. Which makes a lot of sense, because that’s pretty much exactly what they sound like. West Coast has only six tracks, but the opener is a 15-minute instrumental sunshine roadtrip, and the closer is a 12-minute ambient twilight headtrip. Tracks 2, 3, and 4 are postpunky things with vocals and track 4, “Origin”, has some of my favourite ever guitars, painting dirty shapes into the corners of a great groove. I could listen to it forever. I’m not making and great claims for West Coast; it’s not life-changing, no masterpiece, no great artistic statement particularly, but music doesn’t always need to be that. Sometimes it’s absolutely fine for it just to be incredibly cool and good to listen to, which is what this is. Tom Listened: Nick, in response to Well..by Swell (round 34): ‘I wasn’t blown away by Swell (who I hadn’t heard of prior, I don’t think), but I did enjoy listening to Well, and sometimes that’s enough’. 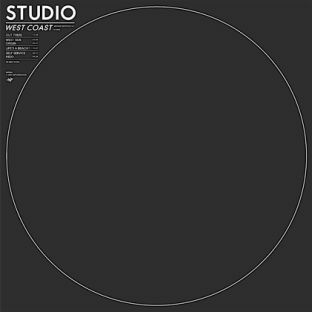 Substitute ‘Well…’ for ‘West Coast’ and ‘Swell’ with ‘Studio’ and my feelings towards Studio have more or less been encapsulated. This was a pleasure to listen to from start to finish – it didn’t place any great demands on me as a listener and so I doubt it would go on to reveal much more but, much in the same way as Swell’s record (and my choice for tomorrow night’s meeting) an undemanding but enjoyable 50 minutes is sometimes exactly what the doctor ordered. In fact, having listened to Studio I was minded to pull out Our Ill Wills by The Shout Out Louds partly as it is a similarly ‘easy’ listen and partly because it sound like the Cure (although in the case of the latter it’s ‘In Between Days style Cure’ rather than ‘A Forest’ style Cure). Rob listened: I’d never heard of Studio and a couple of minutes into ‘West Coast’ it felt like a major discovery. The opening half of the opening track was muscular, lithe, funky, gripping and thirst-making and then… it just seemed to dissipate. The rest of the album sounded real pretty, but never quite managed to get its claws into me again. Perhaps repeat listens would expose more, and I can see that I may go back, but first time around it felt a little bit like being jilted at the altar.